“I met her for a Steak on Monday, took her for a Burger on Tuesday, we were eating more steak by Wednesday”… we are pretty sure these are the original lyrics Craig David had in mind when writing 7 Days, proclaiming his love for midweek food offers – well, that was our take on the song anyway. 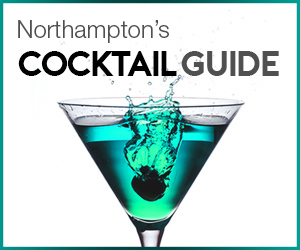 If there is something we like more than enjoying some of Northampton’s fine culinary delights; it is enjoying said delights at deliciously low prices. So we have compiled a collection of the greatest midweek food deals to ensure gents have access to all the steaks, burgers and more needed to help those working days pass by. 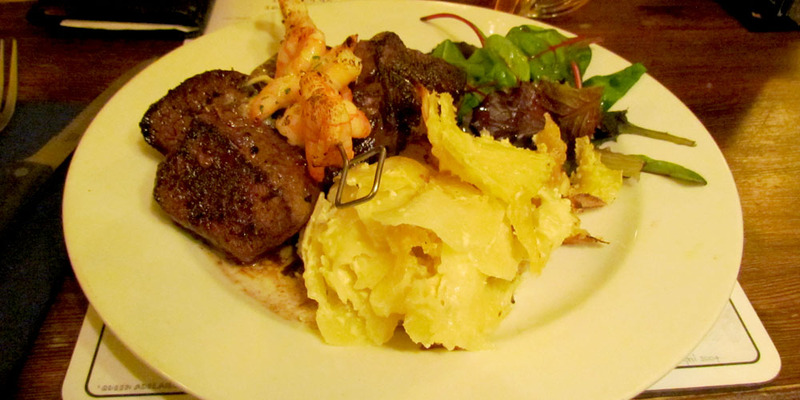 As the old adage goes, “a steak a day, keeps the doctor away”… or something like that. The Queen Adelaide’s Steak Night finally gives gents a reason to look forward to a Monday and is a completely hidden gem that not enough gentlemen in Northampton are taking advantage of. Locally sourced beef is cooked to perfection and served with a choice of potatoes; we would highly recommend the dauphinoise. With 8oz at only £6.95, 12oz at £9.95 and the 16oz mountain of meat for a meagre £11.95, it is arguably one of the best steaks we have had the pleasure of indulging in. GENT TIP: Book and go as soon as gentlemanly possible. From 12pm to 9pm every Tuesday, The Charles Bradlaugh’s new kitchen, the BBK (Bradlaugh Burger Kitchen) serve up a delicious array of burgers to the hungry gentleman of Northampton for half price. This means gents can be tucking in to some of the finest burgers Northampton has to offer for only £4.25; the definition of bargain in our eyes. 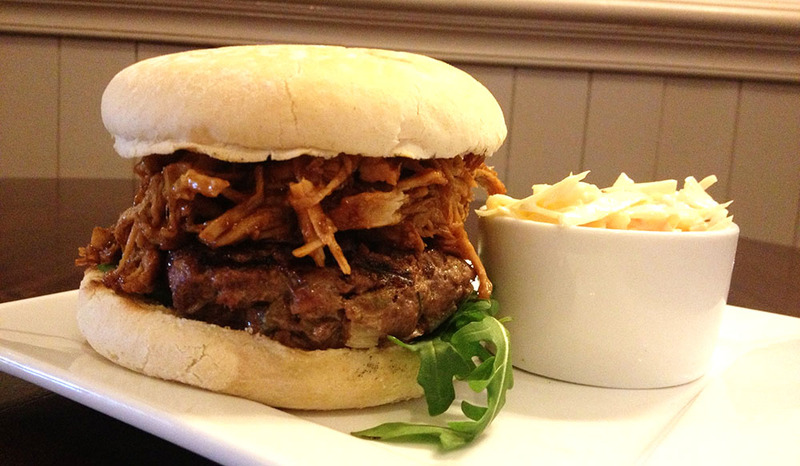 To find out how good the burgers really are, simply read our burger review. Decisions… decisions. Two establishments. Two great burgers. One night. Every Tuesday sees The Squirrels Inn run their burger and pint night. Patrons have the opportunity to enjoy any of pub’s burgers, served with chips, salad, coleslaw and any pint of their choosing for £10. 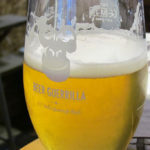 The gourmet burgers are cooked fresh, with pulled pork, chicken and vegetarian options on the menu. A tough decision; Tuesday has just become the Sophie’s Choice of burgers. Gents we understand just how much of a tricky day Wednesday is. Monday and Tuesday are pretty tough but at least the memories of the previous, blissful weekend are still with you. Wednesday however is the mid-point; the previous weekend is nothing but a forgotten dream, whilst the coming weekend is still a depressing distance away. Therefore, it is important for Wednesday to offer something special. This is where Aspers Casino steps in. Every Wednesday, Asper’s Clary’s restaurant gives gents the opportunity to switch chips on the tables for chips on plate, accompanied with a wonderful chargrilled steak of the day and a free £5 slots bet. Steak and slots, who could ask for anything better to help break up the week? 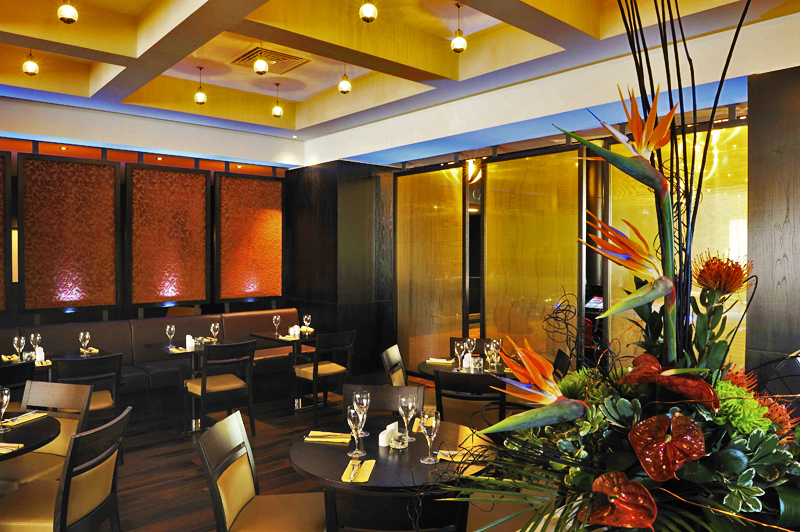 Read the Aspers’ Casino and Clary’s review. So if you are not in the mood for a steak, (what in the world is the matter with you?!) then another of Northampton’s fine establishments has a delectable alternative. 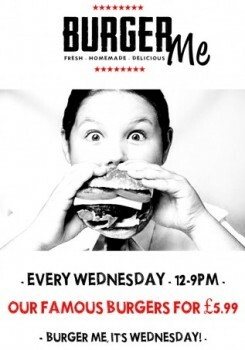 The Picturedrome dedicate every Wednesday to their burgers, offering burgers for just £5.99 from 12-9pm. With a choice out of beef, pork & apple, lamb, venison, chicken and halloumi and all served with chips, there is something for every gent. GENT TIP: The ex-filmhouse also offer gents the option to taste 3 different burgers with their slider option, offering any combination of the 3 house burgers in mini form for the indecisive out there. 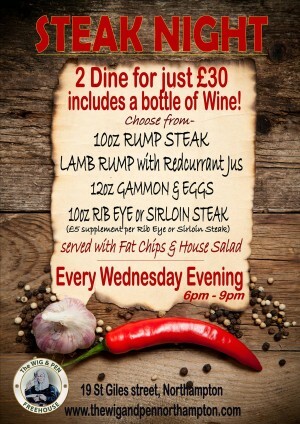 Gents, you truly are spoilt for choice on Wednesday, for the Wig & Pen also holds their steak night on a Wednesday. For £30, 2 patrons can choose from a 10oz rump steak, lamb rump with redcurrant jus, 12oz Gammon & Eggs or 10oz Rib Eye or Sirloin Steak (there is a £5 supplement per Rib Eye or Sirloin Steak however) and also includes chips, salad and a bottle of wine. If we must face the dreaded Wednesday, we would much rather do it with meat and wine in hand. So you have had enough of steak and burgers and looking for a change of pace on Wednesday; well we may have found a perfect alternative. 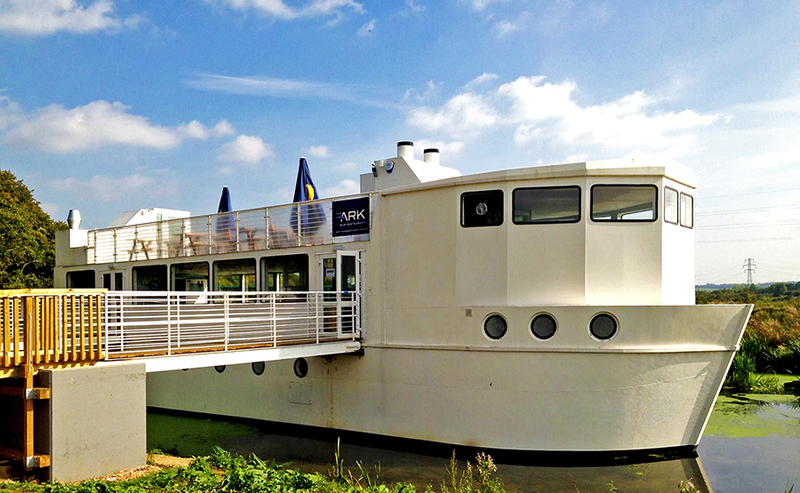 Every Wednesday, Northampton’s only floating restaurant hosts their curry night. Seafaring gents (well, Nene-faring gents) can enjoy freshly cooked curry, with the choice of chicken or vegetable in a spicy tomato sauce and served with basmati rice and a chapatti. 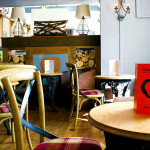 As each curry is cooked to order, gents can choose how spicy they wish to go and is £7.95 per person. Read the Ark review here. The weekend is in sight gents! Thursday is the final hurdle; the last test that must be endured before we reach that glorious Friday. Fortunately mediterranean masters Nuovo have managed to come up with an event that will have gents as excited about Thursday as they are about Friday – or as close as possible at least. 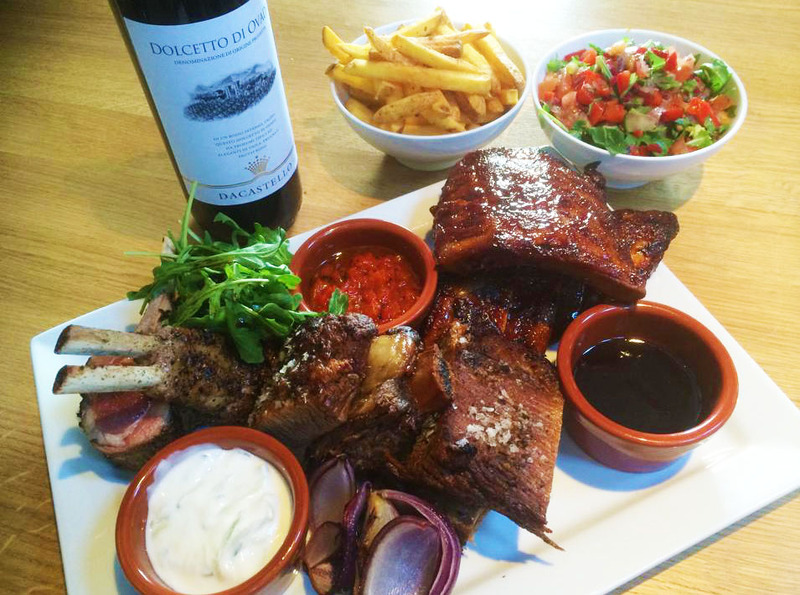 The Rhythm & Ribs night allows gents to dive into a mixed rib platter for two, two side orders and a bottle of Dolcetto d’Ovada for £35. Combine the delicious ribs cooked over a Tuscan grill with some brilliant live music and we are pretty sure Thursday’s will never be the same again. And there you have it gents, a selection of the finest midweek food spots to visit to have you eating like an economical King. Should you know of any other fine deals that should be added to the list above, share with fellow gents in the comments below. The Squirrel does a great steak night on Thursday too!